Sorry I haven't posted all week, I have just been really busy. I am having an open house for my shop in a couple of weeks and I am trying to get all my class projects done in time. 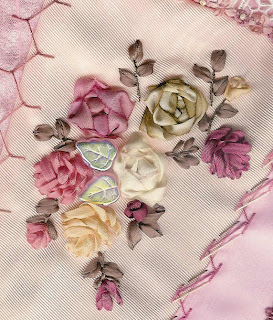 Here is a picture of a little silk ribbon embroidered floral spray that I did I my full size PINK crazy quilt. I hope everyone is having a good week and I'll talk to you in a few days. Oh, and remember to visit Beverly at www.howsweetthesound.typepad.com as she is our wonderful sponsor. You may also click on the top right button and it will take you to her blog. Just simply stunning!! How talented you are!! I remember you from last week -we have the same header(Ella Maes). Beautiful stitches! happy ps. This is so gorgeous! I visited your blog last week also and was super impressed! I'd like to feature you next week as part of Beverly's challenge to us to feature one "new to us" blog in our Pink Saturday post. I would also like to include one of your photographs if I may do so? Go ahead and email me and let me know what you think! Also, be sure to stop by my blog for a great giveaway! Happy Pink Saturday from a fellow bunny lover.....I'm "Crazy" over your rabbit featured on your previous post!! dana of the stone rabbit. Sew Pretty and delicate!! Love to see the whole quilt-Happy PS!